Bilbo Baggins' Sting sword from The Hobbit: An Unexpected Journey! Features a stainless steel blade and solid metal hilt parts. Replica includes a wall display and certificate of authenticity! 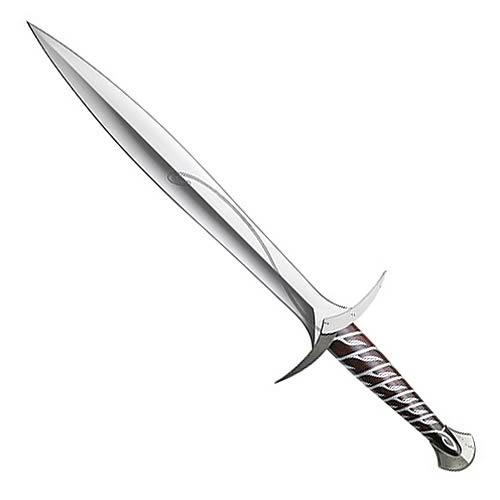 Collect a sword modeled after the very one Bilbo famously used against the giant spiders of Mirkwood in Peter Jackson's The Hobbit: An Unexpected Journey movie! The Hobbit Bilbo Baggins Sting Sword is an authentically detailed replica that reproduces the actual filming prop from the movie sets in New Zealand. The Sting sword measures 22 1/2-inches long with a stainless steel blade, solid metal hilt parts, and an intricately detailed vine adorning the grip. Included with the prop replica are a certificate of authenticity and a wall display featuring graphic motifs from The Hobbit: An Unexpected Journey. Ages 18 and older.